What is the best part of a holiday? The destination and that awesome feeling. And the worst part? The planning, of course. Honestly, I am an avid planner and when it comes to travel I leave no stone unturned. My husband and I try to take a vacation every quarter and we plan our year around this. Traveling on a fixed budget is never easy, but if the planning is right, you may even get to save some money from the budget. What the first step in planning a vacation? Yes, choosing the destination. The next step is to decide how you would get there. Air transport has become so convenient these days that you can fly to any destination from any city. The one thing that troubles me as a traveler is the fluctuating prices of the flights. One day it is low, a few days later it is high and a few days later it is back to being low again. This sinusoidal wave of high and low always puts me in a pickle when I sit down to book my flight tickets. A few years ago, when we booked our tickets from Bangalore to Delhi we paid close to 30,000 for two return tickets. This was because we booked the ticket one week in advance. Next, when we had to travel to Sri Lanka, we decided to book our tickets a month in advance and we ending up saving quite some money. Not much, but something at least. That is when we realized that when it comes to travel, the earlier you book your flight tickets, the better. 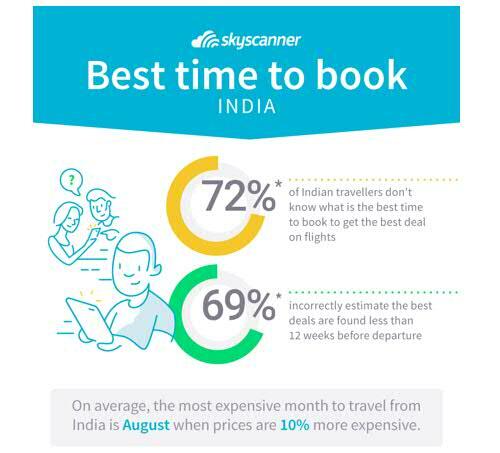 A recent survey of Indian travelers by Skyscanner revealed 72% do not know when is the best time to book flights. The survey further unveiled 69% of travelers incorrectly estimate the best air fares can be found less than 12 weeks before departure, when in fact the best deals are snapped up by travelers who plan in advance. Travelers eyeing up Bali for their summer trip can save up to 51% on flight tickets by booking 25 weeks in advance or risk paying 27% more than the average fare when they leave booking to the last minute. While hotels offer better deals and promotions as the date nears, with flights you have to plan ahead. Much ahead. Planning the dates of travel is important, but it is more important to be smart about it. Did you know that August is the most expensive month to travel? As per the survey, the prices during this month are 10% more expensive. There goes my birthday vacation! Actually no, since I have been smart about travel and after having been bitten more than twice, I now have learnt my lesson. I had booked my tickets way ahead and this has indeed helped me save a lot of money. Now, I normally book my tickets at least 12 weeks in advance when it is a domestic vacation and at least 16 weeks in advance when it is an international vacation. But it turns out that I can save more, if I book more early. Fancy that European vacation? 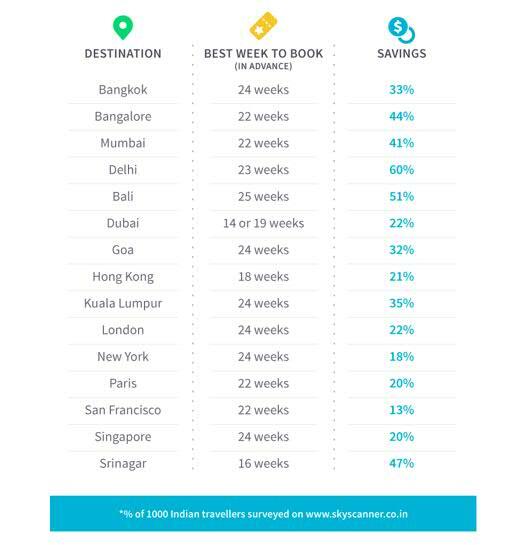 Skyscanner recommends booking 24 weeks in advance for travelers venturing to Europe or the USA for their summer vacations for savings of 22% and 18%, respectively. I know what you are thinking. Who thinks about planning a vacation six months ahead? Even the leaves would not have been confirmed. Then again, how about planning your vacations for the year as soon as you ring in the new year. Once you have your tickets in place, everything else somehow manages to fall in place. You can also be a little smart about the destinations and plan your vacations much in advance and save more money. November is the cheapest month to travel to Bangkok when flights are 10% cheaper than the average fare, while visa-friendly Bali can be best enjoyed in April with a 10% saving on the average fare. Keeping this in mind, you can plan at least two to three vacations a year. Skyscanner gives you a rough idea about how early you should book your tickets and how you can save more money on your flight tickets. While the flash sales on many sites might seem too good to be true, some of it actually is very true. But this one makes sense only when you book way ahead. It is not too hard, all it takes is only a little bit of advance planning. Based on the above survey you can save up to 51% on your flight tickets to Bali if you book your tickets 25 weeks earlier. With the money you save maybe you can book a ticket to Cambodia as well. With everything around us moving to the smarter technology, it is time that we travel smart as well. While everything is in place and makes your life easy, planning a vacation early can help you travel smart. In this case, the early bird not only gets the worm. But saves some of it too. ~ Skyscanner is a leading global travel search company, providing free search of flights, hotels and car hire around the world. ~ Founded in 2003, Skyscanner helps over 60 million people each month to find their travel options. ~ Skyscanner is available in 30 languages. ~ Skyscanner’s highly-rated free mobile app has been downloaded over 60 million times. ~ Skyscanner employs over 800 staff and has 10 offices across the world: Barcelona, Beijing, Budapest, Edinburgh, Glasgow, London, Miami, Shenzhen, Singapore and Sofia. ~ Skyscanner is part of the Ctrip Group. Check more about Skyscanner here. 51% saving is too cool. Agree, if we plan for the vacations pretty well in advance, the savings can be huge and the same can be used for more travel and of course, my favorite... shopping! Thanks for introducing me to Sky scanner. Now i know whom to approach!